Brave and Courageous Healers: Holding and healing your own stories of trauma so that your clients and communities can hold and heal theirs. What does it take to hold space for your own healing and the healing of others? How do you understand trauma, repeated trauma and what it takes to heal? What does it mean to use your own life experience in the work you do as a clinician and still create an environment that is about your client and your client’s work, and not about your history? How can we lean into our shared humanity and compassion to create environments that are safer and more conducive to growth and healing for everyone--clients and therapists alike? Hosted By: *Students Impacted by Ableism* offers support for students with a wide range of abilities and intersectional identities. We unite to challnege ableism at all levels at Smith School for Social Work and beyond. We meet weekly to build community and develop programming to raise awareness about how ableism intersects with other forms of oppression. Gretchen Schmelzer, PhD, will be presenting on her latest book, Journey Through Trauma: A Trail Guide to the 5-Phase Cycle of Healing Repeated Trauma on Wednesday, June 27th at 5pm at the Chilmark Library. Trauma is widespread in America; from 1994 to 2016, 84 million children were treated for abuse, over 4 million for sexual abuse. Domestic violence during the same period affected 30 million women and two million men. Yet, despite its prevalence it often goes undiscussed and untreated. Schmelzer, a licensed and practicing psychologist, has worked for over twenty-five years with the complex issues of trauma, integration, and behavior change across every level, from individuals to groups to large systems and countries, in private practice and in public clinics. Trained at the Harvard Medical School and a trauma survivor herself, Schmelzer is uniquely skilled to help survivors understand the uneven terrain of the healing process and stay on the non-linear path to recovery. Using what she has learned in her years of work on this issue, Schmelzer’s book recognizes the three basic principles: Healing is possible. It requires courage. And it cannot be done alone. Journey Through Trauma is written specifically for survivors. The reader will learn the five phases that every survivor must negotiate along the way and how to stay motivated on this challenging path to recovery and healing. Please go to http://gretchenschmelzer.com for more information about this book and Schmelzer’s other works. Sponsored by the Friends of the Chilmark Public Library. The statistics for the number of people recovering from a trauma are astounding. From 1994 to 2016, 84 million children were treated for abuse, over 4 million for sexual abuse. Domestic violence during the same period affected 30 million women and two million men. And in regards to post traumatic stress disorder (PTSD), the USDVA released a study showing that from 1999 to 2010, roughly 22 veterans were dying by suicide per day, or one every 65 minutes. These numbers are conservative. In her twenty-five years as a psychologist, Gretchen Schmelzer has watched too many of these traumatized people quit during treatment for trauma recovery. They have found it too difficult or too frightening or just decided that for them it was too late. But as a therapist and trauma survivor herself, Dr. Schmelzer wants us to know that it is never too late to heal from trauma, whether it is the suffering caused within an abusive relationship or PTSD resulting from combat. 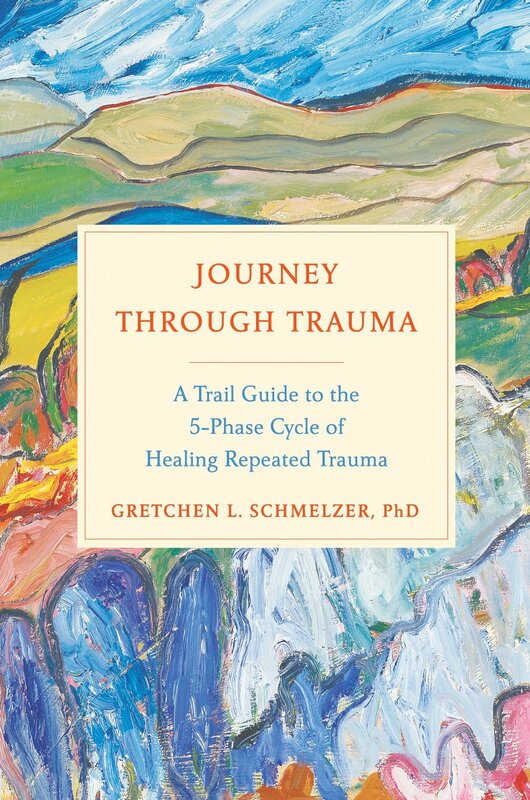 JOURNEY THROUGH TRAUMA: A Trail Guide to the 5-Phase Cycle of Healing Repeated Trauma by Gretchen Schmelzer, PhD is specifically for survivors–to help them understand the terrain of the healing process and stay on the path to recovery. Sometimes what feels like a big setback is actually an unexpected difficult step forward. From an emotional, cognitive, spiritual, physical, and relational perspective, each phase has its own focus and purpose, as well as its own set of needs to attend to. Each phase requires a different set of skills and capacities from the survivor and their guides or support system. What works well in one phase doesn’t necessarily work well in another phase, which is why one-size-fits-all treatment plans usually don’t work, and why Dr. Schemelzer’s plan is unique. This new method of healing allows the survivor to know where they are in the process, what the work is, what the challenges are, and what they can do to move through the stages gaining the healing and learning they need. Because the cycle of healing repeated trauma is not linear, the survivor will come to understand that circling back around to a previous stage actually means progress as well as facing new challenges. Ultimately, the healing journey is one of trust as survivors come to trust their capacity to rely on help from others and this book, and to trust themselves and the work they have done. Gretchen Schmelzer, PhD, is a licensed psychologist, trained as a Harvard Medical School Fellow. She is a trauma survivor who has worked for twenty-five years with the complex issues of trauma, integration, and behavior change across every level, from individuals to groups to large systems and countries. She has worked with individuals and groups in large clinics and clinics in housing projects, in residential treatment facilities, in psychiatric units and medical hospital units, and in private practice. She has more than a decade of experience working with traumatized children and adolescents in residential treatment and psychiatric units. She is the founder and editor of The Trail Guide, a web-mag featured on www.gretchenschmelzer.com dedicated to healing repeated trauma. Tracie Gardner has worked more than 25 years in the public health, public policy, not-for-profit and New York State government fields. She has been a policy advocate, trainer, lobbyist, criminal Justice and health liaison for the NYS Department of Health and an assistant secretary for mental hygiene for the New York State Governor’s office. She has led advocacy campaigns that won substantial increases in funding for substance use, HIV and alternatives to incarceration and reentry services and worked on landmark health, HIV confidentiality and testing legislation, and landmark criminal justice reforms.